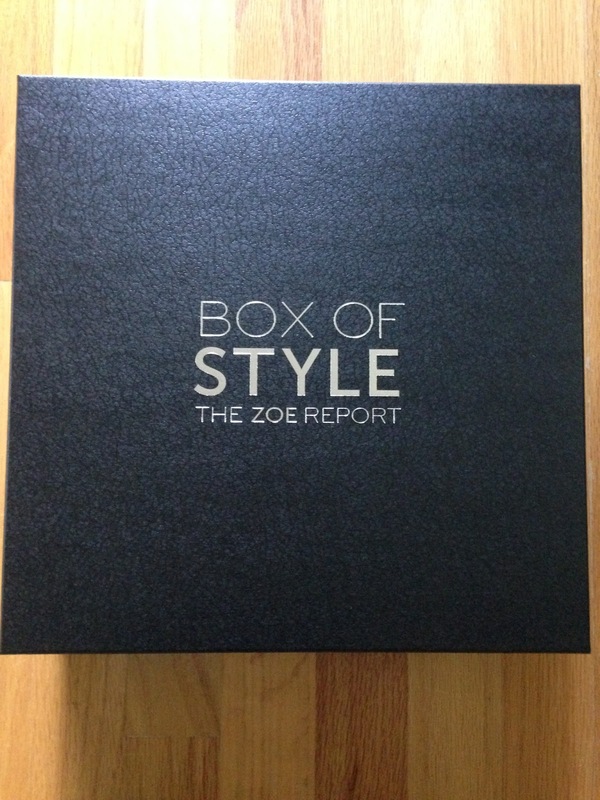 My Zoe Report Box of Style Fall box arrived today! I couldn't wait to see what was inside. I thought I'd be getting my box early, because it seemed to ship awhile ago, but it took a long time to get here (or it seemed like a long time to me). I didn't look at spoilers because I wanted to be surprised. I knew what the hero item was already, so I knew I'd love the box! When the box arrived today I was so excited to open it! 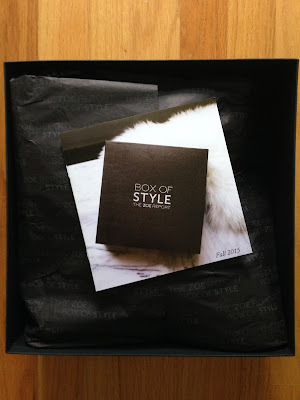 I love how luxe this box is! It really feels like a special gift each quarter. Here is a first look. The Box of Style information booklet is one of the best I've seen in subscription boxes. It includes Rachel Zoe's thoughts on the item and tips and retail prices of all the products included. I had to take pictures of all the pages to show you. If you look at the booklet, it'd spoil the surprise, so when I opened this box I set that aside and opened everything up first. Then I looked at the booklet after. 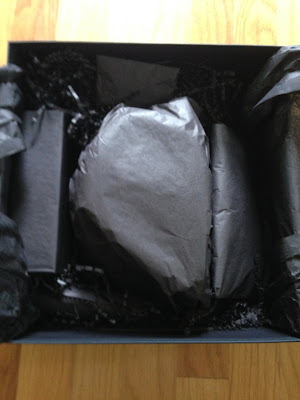 This picture is a little blurry, but this is how everything came packaged in the box. 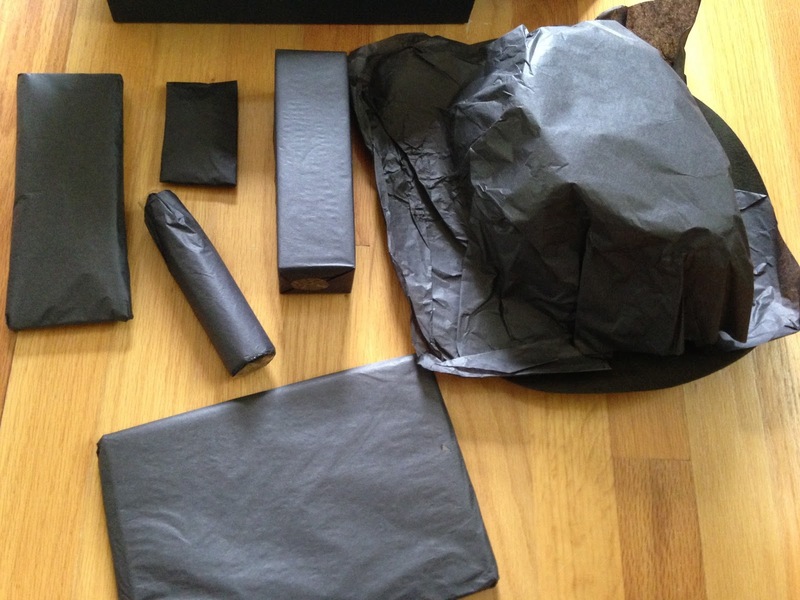 Everything is wrapped in black tissue paper. From the first look I could kind of tell what one of the items was. Then I pulled everything out and took a pic before I unwrapped them all. Now I definitely knew what one of the items was. The hero item is released when the Box of Style goes on sale. This item is the most expensive piece in the box. For Fall it was the Cluse La Boheme Rose Gold Watch with Dual Straps. Retail price $132. I loved this watch when I first saw it, and it is even better in person. I love rose gold! The black face is perfect for Fall and I love the over-sized face. I have a small wrist, but I still love large faced watches. This is amazing because it comes with two sets of straps, one set grey and one set black. And they are so easy to change! Plus it came in a beautiful pouch. I love everything about this timepiece, EVERYTHING! If this was the only item in the box, I would have been happy! Oh, and the grey band totally matches my new Kate Spade bag that I recently purchased for Fall. Yay! The item I could tell right away was the Topshop Classic Fedora. Retail price $48. I guess it's hard to hide a structured hat in a subscription box. 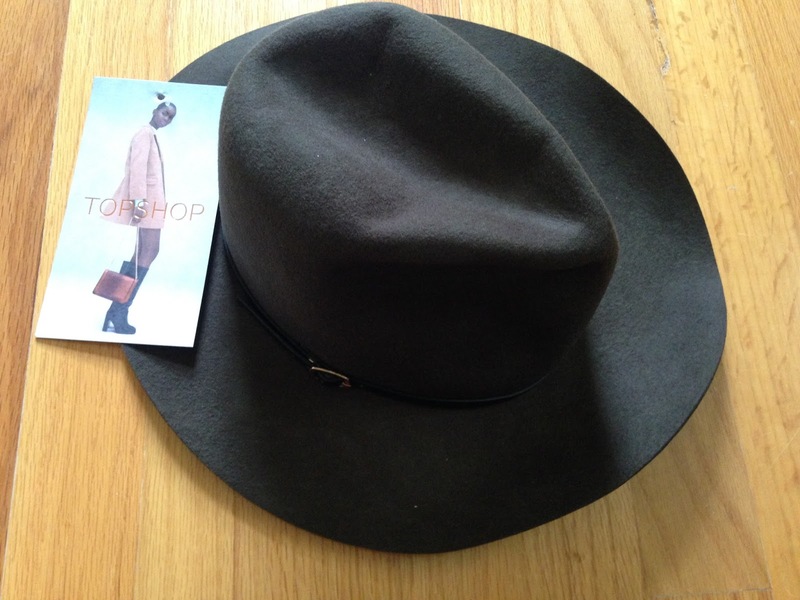 This hat is a felt olive green fedora. I'm not a hat person, mainly because I have a tiny head and they never fit me unless they are kid sizes. I have a niece who loves hats, so this will be going to her. She'll love it! It's great for Fall and went nicely with this box, but just isn't for me (because it doesn't fit). 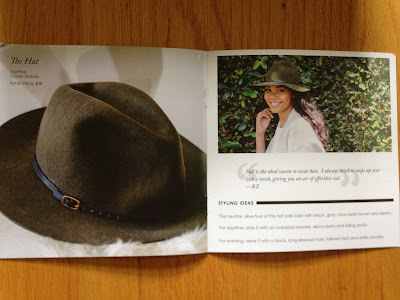 I can totally see Rachel Zoe looking amazingly chic in this hat for Fall though. 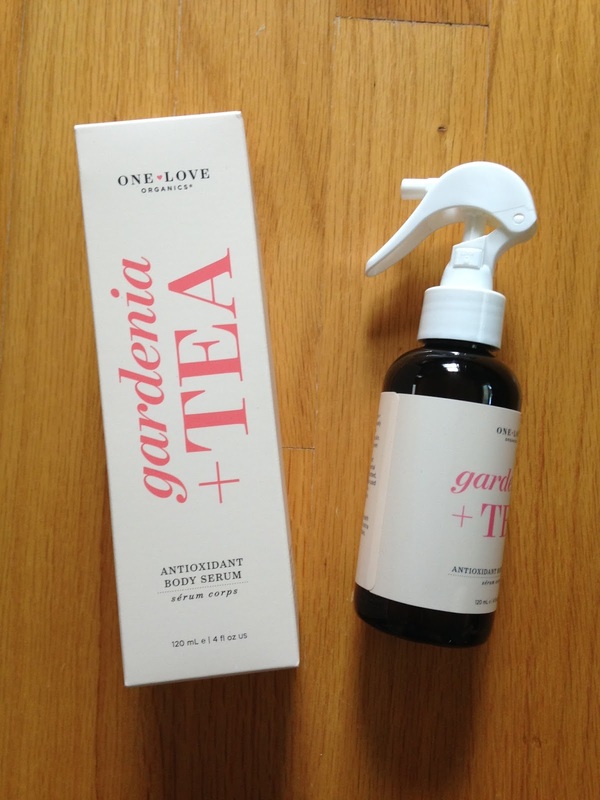 Another item included was One Love Organics Gardenia + Tea Antioxidant Body Serum. Retail price $39. 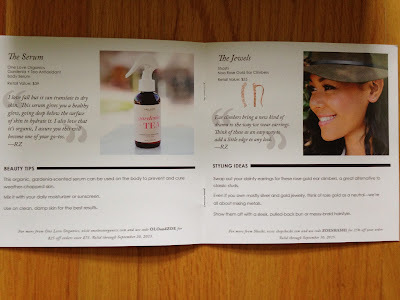 I received this in a Popsugar Must Have box before and I use it all the time. It's really moisturizing and makes my legs smooth and slightly shiny without feeling greasy. It also smells beautiful! I was just thinking I was going to have to buy some because I'm almost out, and then this showed up like Rachel Zoe was reading my mind. This is a MUST HAVE for me. I love love love it! 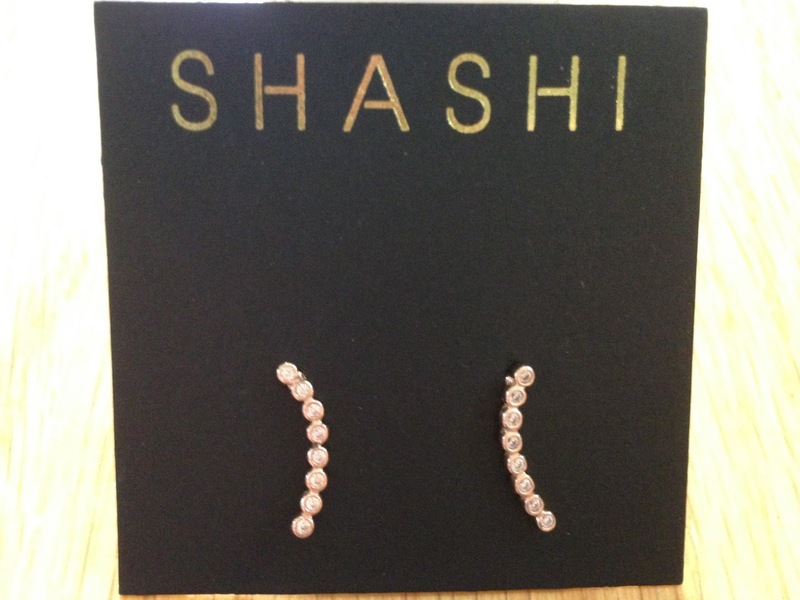 I also love the Shashi Noa Rose Gold Ear Climbers! Retail price $55. They are perfect! 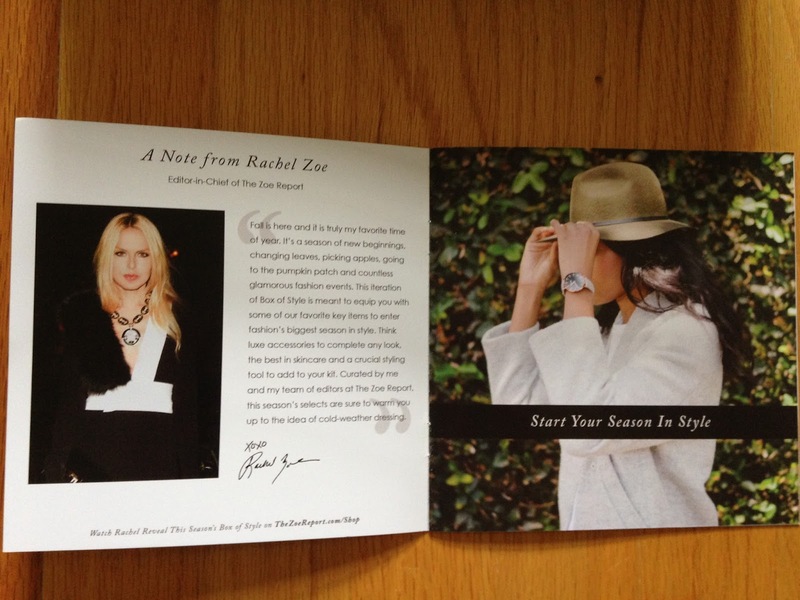 And yet another item that made me feel like Rachel Zoe channeled my thoughts and sent exactly what I wanted. I love rose gold as I already mentioned. I love delicate jewelry and I don't already own ear climbers, but love how they look. I've wanted some for awhile now. 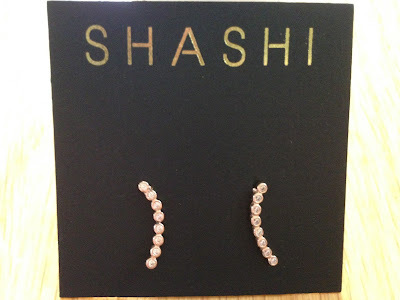 And these are exactly the type I would have picked for myself with little crystals and rose gold. Delicate, beautiful, and lovely! I tried these on immediately and I'm pretty sure I'll be wearing these every day now! At this point it didn't even matter what else was in the box, I was already beyond excited! 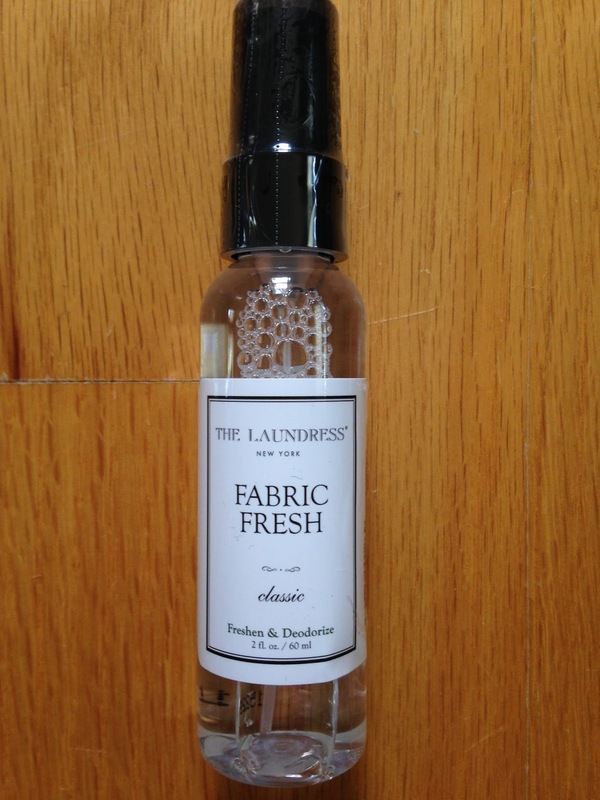 The Laundress Fabric Fresh Classic was the next item I opened up. Retail price $8. I haven't tried this yet, but I'm sure I'll love it to freshen up the house or car. I've tried other Laundress products and they smelled nice, so I'm sure this will too. I'm happy this was included instead of more make-up products, because I'm over loaded with make-up lately. This is a nice change and definitely something I'll use. 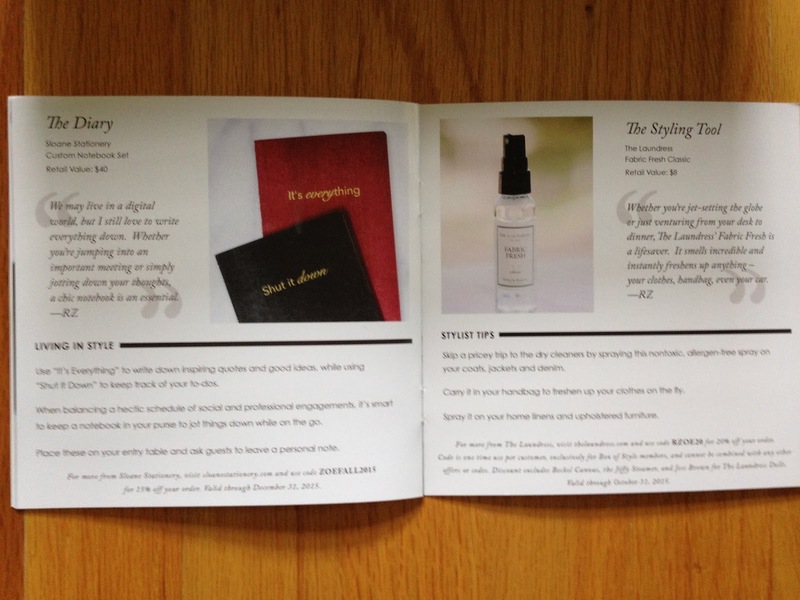 The booklet says you can use it on clothes, home linens, or upholstered fabric. I think it'll be great for towels also! The final item included was Sloane Stationary Custom Notebook Set. Retail price $40. 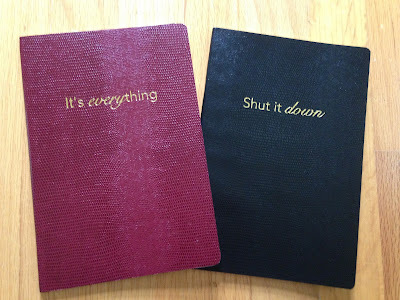 I really like notebooks and I should use them more. I have a habit of writing things on sticky notes and leaving them in random places in an attempt to try to remember something, but misplaced sticky notes doesn't help me remember. I will be keeping one of these in my bag, so I can write things down in an organized manner! These are perfect for Fall. The red one says "it's everything" and the black one says "shut it down". The paper is lined too, which I need! 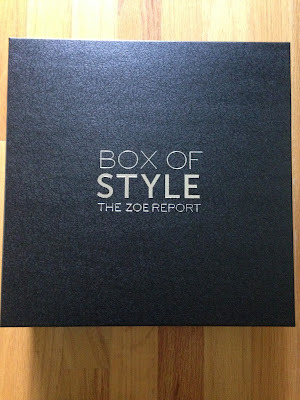 I loved the Zoe Report Box of Style Fall box! I'm being completely honest when I say this box is worth the price. 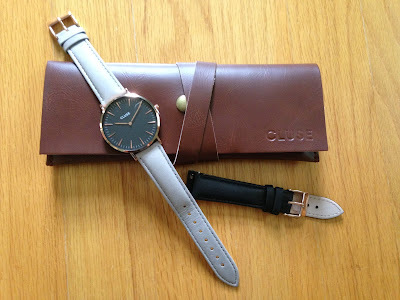 If I had seen a Cluse watch in a store, I would have bought it at retail price without thinking twice. I feel like a lot of subscription boxes inflate prices to make the value seem higher. And I am okay with that, as long as the price I pay for the box is worth it in my opinion. This box is and more! I won't use the hat, but I know it will make my niece happy. And even without that item, I am ecstatic with everything else included. 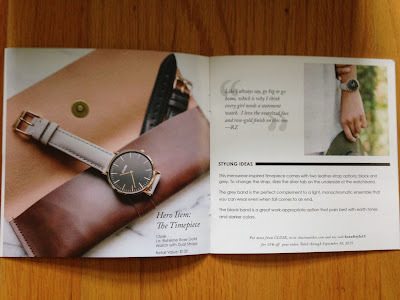 The watch and earrings are gorgeous and everything else is just bonus! Actually, if I opened this box and only saw that watch I would have been happy, seriously! I can't wait to see what the hero item for Winter is!!! I hope they announce it very soon. If you are not subscribing yet, why not?!? You can use my link to save $10 on your first box.